The ramblings and observations of a Canadian ex-pat living and working in Seoul, South Korea. Somewhere between Donghae, South Korea and Vladivostok, Russia. Off the coast of North Korea. Lying in my bunk, I can feel the constant vibrations of the mighty diesel engines and the very slight swaying back and forth as our vessel plies the waters of the Sea of Japan. Eight hours ago, we set off from Donghae, South Korea, aboard the Korean ferry Eastern Dream. Earlier this evening, sitting on the deck of the ship, it occurred to me why I found the view of the sea around me so unnerving: it's flat. Korea is many things, but flat is not one of them. For the past two years, I have been surrounded by mountains. Granted, they lacked the majesty of Canada's mighty Rockies, but they were omnipresent. Now, I am surrounded on all sides by flat ocean as far as I can see. Perhaps this voyage is preparing me, in some small way, for a return to the prairies of my home. This day has been so surreal. It took a long time for it to become apparent that I am actually leaving Korea for good. As I watched the coastline slowly recede, it finally began to hit home. I leave behind two years of great friends and the best time of my life. So far, that is. What lies ahead? Who knows. But as I begin the next chapter, I find myself so grateful for this time of retrospection. I can't imagine immediately returning home after these past two years and experiencing anything approaching normality. This time is needed for decompression and to reflect of what these two years have meant to me. As our ship chugs along through the inky blackness, I keep hoping that the clouds will clear, revealing the awesomeness of the night sky without the interference of Seoul's lights. Alas, the clouds never do dissipate, and we remain mired in the infinite black. I miss the stars, but I take solace in the fact that they can't hide forever. Time to get some sleep. In about thirteen hours, we arrive at Vladivostok port in Russia. For now, we keep sailing along, giving the coast of North Korea a wide berth. Tomorrow, I set foot in Russia for the first time. As I write this, I am sitting in an internet cafe in the small town of Donghae, South Korea. Today is the last day I will spend in this country, a culmination of two years of teaching English, being immersed in a foreign culture, and one of the best experiences of my life. So far. Tomorrow, my friend Fergal and I will board a ferry bound for Vladivostok, Russia, taking our first steps on what I hope is a pretty epic journey. My internet time during this trip will be pretty scant, and there is a good chance that this blog will see very little activity in the way of updates for the next month and a half. But then again, what else is new? Our travels will take us to Lake Baikal, Irkutsk, Moscow, and St. Petersberg. From there, we will make our way across Europe, traveling through Belarus, Poland, Germany, the Netherlands, Belgium, and France. Taking a ferry across the Channel, we will see the white cliffs of Dover before moving on to London. From London, I will fly back home to Canada, with a brief stop in Reykjavik, Iceland. Because, well, why not? As I said, internet access might not feature much in this trip. However, I would like to write about my experiences and provide some pictures. Rest assured, if I am able, I will endeavour to do so! The current plan is to arrive home on October 9th. Wish me luck! Today I learned: I don't know what I really like or dislike. For twenty-nine years, I've maintained that I don't like coffee. Well, okay: to be fair, for a number of those years I didn't really have a choice in the matter. Still, it's fair to say that I've been pretty consistent about my dislike of coffee. Then, just this last week, I went out for coffee with my co-workers. For those of you living and working in Korea, you know things are a little different here. If someone above you in your hierarchy offers you food or a drink, it's extremely rude to say no. So, there I was, a table of my "betters" all staring me down as I was asked which coffee I would like. Needless to say, I was compelled to drink. It was a fairly high-end coffee place, so I decided to try something interesting. They featured coffee from a number of different countries, and I thought I'd give the Guatemalan coffee a try. After the first bitter sip, I pasted a fake smile on my face and pronounced it good, much to the delight of my fellow teachers. However, as the aftertaste made itself known, I began to come to a startling realization: it didn't taste bad. Not bad at all! Tentatively, I took another sip. Not holding my breath this time, I allowed myself to fully experience the taste and aroma of the coffee. By the end of the cup, I was fully appreciating the taste of this heretofore reviled beverage. The lesson here is, if you didn't like something when you were younger, don't wait fifteen years to try it again. You may be surprised. For my coffee lover friends, what is your favourite coffee? What should I try next? I feel like a whole new world has opened up to me, a world I know next to nothing about! Oh, and by the way, Guatemalan coffee with 팥빙수 is ridiculously amazing. It concerns me how many of my posts are/will be about food. Lunchtime in Korean middle school. For some of my fellow ex-pats, this topic is a source of contention. To hear many of my friends speak of the lunches at their schools, you would think that they are the worst thing in the world. Still others rave about the food they are served. You can definitely count me in the latter of those two groups. 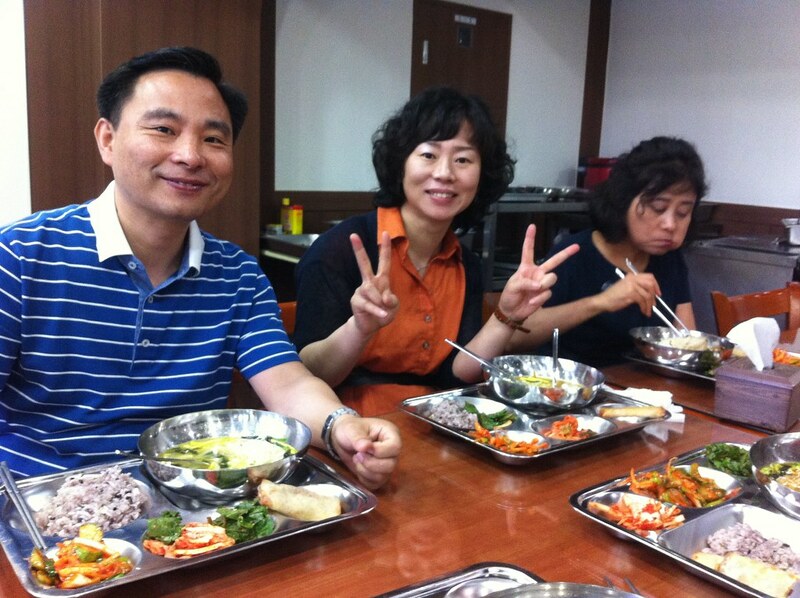 I am usually very impressed by the meals served by the cafeteria at Sinsang Middle School. It sounds like I certainly got lucky when it comes to the food we're served! Sure, there is the occasional dud, but for the most part the food is satisfying and delicious. Lunch is served buffet-style, and teachers line up to fill their trays from a selection of foods. The main feature of the meal is rice, followed usually by some sort of meat dish, a vegetable dish, and kimchi (of course!). A soup normally rounds out the meal. The serving area. The red container holds the rice. had a noodle dish. Also included were some kind of pizza pocket-things. Lunch time also affords opportunities for socializing with co-workers. Unfortunately, sometimes the English content of the discussion is limited! As I said, the food is usually good quality and delicious. However, bibimbap day is something altogether special! 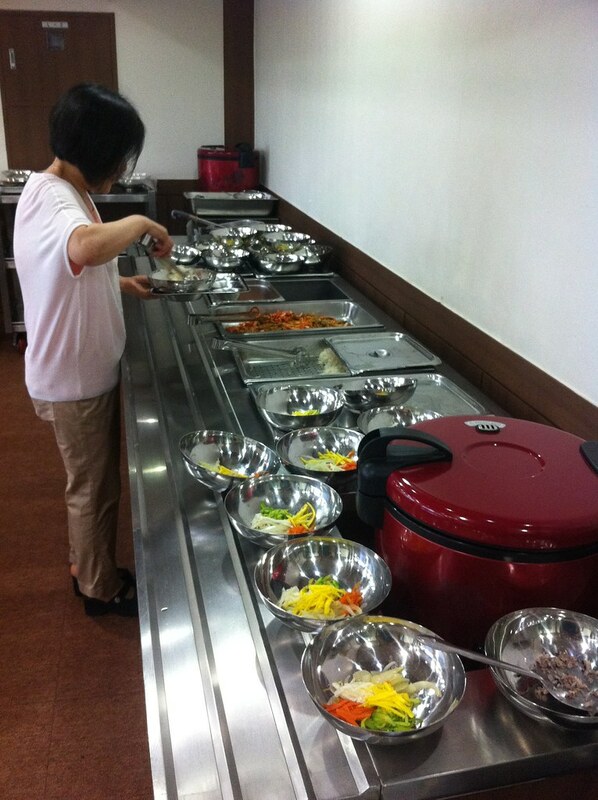 Nothing compares to entering the lunch room and discovering that this king of Korean dishes is the day's featured menu. Bibimbap day causes me to do my happy dance (even if it's just in my head so as not to confuse and frighten the Korean teachers)! 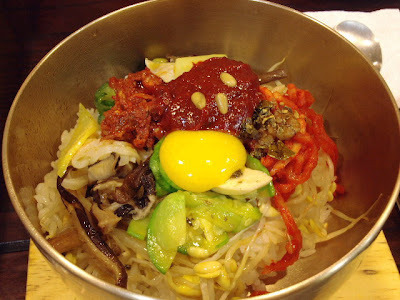 Things I will really miss about Korea: bibimbap day. Things I'll miss about Korea #3: Pamphlet Immunity! One of the small joys I get here in Korea is being ignored. Well, to be fair, as a foreigner, I actually get quite a lot of attention from people in the street. However, there is one situation in which I am often overlooked, and I am quite happy in these cases. The people on the street who hand out flyers and pamphlets are quite insistent and in-your-face. Also, I don't know if it is a byproduct of the politeness culture in Korea, but many more people seem to be willing to accept a pamphlet or flyer from a hawker here than the average person would be back home. Perhaps that's why the practice seems to be more wide-spread, at least here in Seoul. However, many of the people handing them out seem to be quite rude. In one instance, I saw a man walk alongside a woman for nearly half a block, holding a flyer against her arm while making his spiel. She was doing everything she could to ignore him, but he wouldn't have it. I would have been livid if someone tried to do that to me! The good news is, they generally don't. When one of these people sees my foreign face, they assume that I can't read or understand Korean and generally ignore me. (For the most part, they're correct, but I probably understand a lot more than they assume.) There are exceptions (churches being the main one), but for the most part, street advertisers are simply something I don't have to deal with. Another exception was a local gym that recently opened near my officetel. They actually had an English-language pamphlet for me to read, and after looking it over, I am now a member there. Sadly, in this case, street advertising actually worked on me. However, it's quite a nice gym, and hopefully I can get into enough of a habit of going that I continue to lose weight after I return home to Canada. No regrets! The Seoul Metropolitan Subway System. What better time than to crack open a good book? Unless the Korean soccer team just played; then, you may have to wait. Although you might need the smart phone subway app. Fall asleep before you reach your transfer? Because, after all, everything in Korea must be cute. How can they keep track of it all? Nowon station is coming up soon. Apologies for that, it turns out I am not a poet in the slightest! I do want to say that I've never seen a public transportation infrastructure as advanced and convenient as Seoul's. The bus system is also very good, but I mostly use the subway so I don't have much experience in that area. The English signage is definitely a great thing for us English-speaking ex-pats, but even moreso to visitors only in the city for a few days. To give you an idea about some of the things I mentioned above, I've included a few pictures of the subway system. Click on the thumbnails for a larger view! Exits and entrances to the subway stations are clearly marked. The inside of Digital Media City station. Notice the signage in Korean and English. After getting a subway card, you merely swipe it to walk through the gates to the platform. Choose which direction to go using the convenient signs showing the stations in either direction. English and Korean signage show the direction of travel for the train. And a status indicator shows the current location of the next train! Convenient maps show the layout of the station. And other maps show the points of interest and landmarks in the surrounding neighborhood. There are many escalators to get to and from the platform from ground level. I try to use the stairs as much as possible, but not at Itaewon station. Good God! EDIT: I meant to include this video. This is poetry done right! The following video features a song written and performed by an ex-pat living here in Seoul. The music you hear at the beginning and a various points in the song is actually the tune that many of the lines play on the train when approaching a transfer station. Also, this video has actually been featured on monitors in the subway stations! Here's a link to his YouTube Channel. As I begin my first entry in this series, I would like to stress that this list is not in any order whatsoever! It may seem silly to start this series with something so seemingly insignificant, but that's because you don't understand how great this phenomenon is. Without further delay, I introduce to you the first thing I'll miss about Korea: Pizza School. The Pizza School closest to my apartment, only one of hundreds of locations throughout the country. Now, don't get me wrong: there are many, many better things in Korea than a budget pizza chain. Like I said, this list is in no particular order. However, you can't understate the value you get for the price. 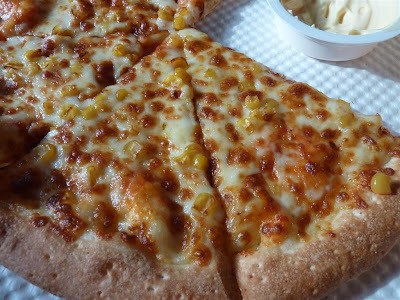 Pizza School offers a fairly large-sized pizza for the ridiculously low price of 5000 won! For those of you who don't know the exchange rate between won and dollars, according to xe.com, 5000 won equals around 4.34 CAD. The box. They even wrap it in a nice, little ribbon. Like a present! A delicious, cheesy present. Now, granted, Pizza School pizza isn't exactly the highest quality pizza out there. This isn't Ramona's Pizza in Grande Prairie or even Boston Pizza's pizza... but it's not bad! Did I mention that price? For less than five dollars, you get the equivalent of a Domino's or Panago pizza. Let's look at the price, in Canadian dollars, of a regular pepperoni pizza from Domino's, for example. Pricing out a medium pepperoni pizza on Dominos.ca yields a final cost of $17.31. Even if we take away the delivery charge, that still leaves us with a pizza that costs $12.49. Here, at Pizza School, I can buy an equivalent-quality pizza (I would say, even better quality, actually) for only slightly more than a THIRD of the cost! Greasy, delicious -- and better than Domino's! Consistent quality at an absolute rock-bottom price earns Pizza School a place on the list of things I will miss about Korea.